It’s a question I get asked all the time, “How much should I worry about resale value while I’m remodeling my kitchen?” The truth is, there isn’t a single right answer for everyone. How long do you plan to live there? How extensive are your remodeling plans? Are your lifestyle needs different than the average homeowner? How important is the return on your remodeling investment? If you were to narrow it down to one question, I think the most important has to do with the length of time you intend to own the home. For my clients, I break it down to 3 time frames: Sell It Soon (< 2 years); Sell It In a Little While (3-7 years); Sell It Later (7 years +). Does your neighborhood cater to the young and hip or is it a more established and traditional area? Either way, you want to adjust your design style accordingly. Go for the most visual bang for your buck. If your budget doesn’t allow for both the all-wood cabinet and the fancy doorstyle, opt for the fancy doorstyle. Remember, looks count. Longevity doesn’t. Even though you might be turned on by bold uses of color, homebuyers generally aren’t. Skip the color wheel and opt for light wood tones and neutral finishes (most homebuyers visualize better with a blank canvas). His and Hers warming drawers, motorized spice racks, and built-in espresso machines might be just what you always wanted in your dream kitchen. But when it comes to resale value, you’ve just thrown a lot of money out the window. Stick with the basics – pick an appliance line that’s appropriate for your home (too entry-level can turn off a discriminating buyer; too luxurious is a waste of investment) and stick to the basic models. When in doubt, pick the stainless steel finish in a less-expensive line. 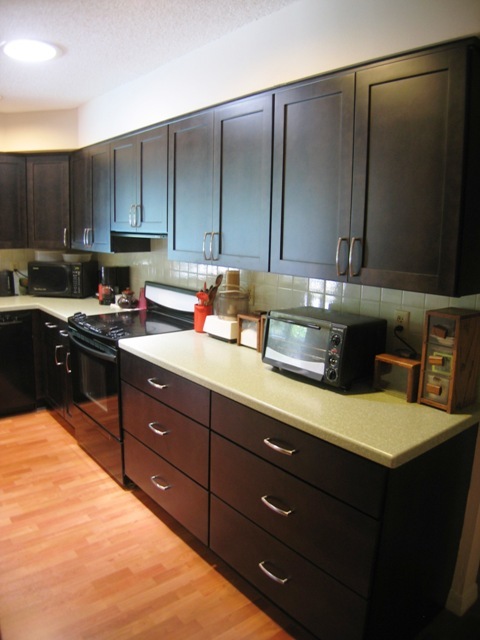 For storage conveniences – no more than a couple well-placed roll out trays and a lazy susan in the corner. Nothing eats up a kitchen budget faster than moving walls and all the mechanics that go with it. Don’t try to make all the design changes that have bugged you while you lived there. You’re not trying to solve your problems, you’re trying to sell your home. If you aren’t sure, ask a design professional if a structural change is a wise idea. If you’re selling your home soon, it pays to follow the latest styles. Right now, simplistic is in – simple lines, warm tones, stone countertops, stainless steel appliances. 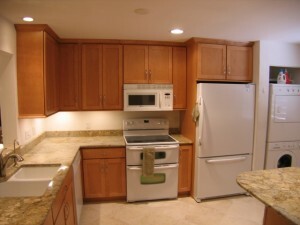 The more current the kitchen looks, the more attractive it will be to potential buyers. the hottest colors for the next few years? Greys. Proper Lighting is a Must! Lighting is so often an afterthought, but it needs to be a priority for resale. A good lighting design can change the whole demeanor of a small kitchen. Plan it from the beginning. If your kitchen seems small, consider reducing the amount of cabinetry you have. Creating a focal point with negative space is not only visually pleasing, but it will cut down on your budget by reducing the amount of cabinetry you require. If you follow these basic rules, you should end up with a kitchen that potential buyers love – at a price that won’t break your bank! 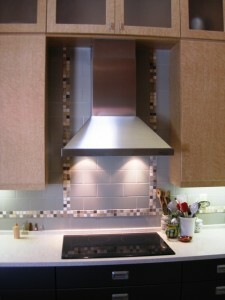 This entry was posted in Design and tagged appliances, colors, kitchen design, remodeling, resale value, tips, trends. Bookmark the permalink. Thank you so much for making my kitchen so beautiful. I love it and can’t thank you enough.